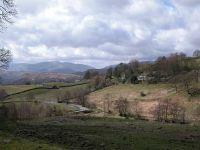 On Easter Sunday 2006 I set out for Wansfell, a top laying immediately east of Ambleside and part of the Kentmere group of fells. 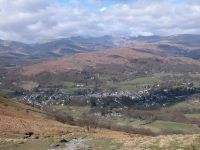 The route initially follows a road behind the Salutation hotel at the northeast corner of Ambleside's town centre. 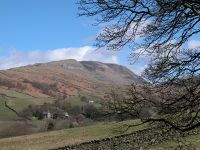 Wansfell Pike is glimpsed through the trees. 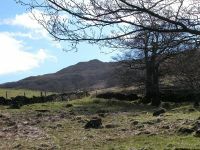 The fell is the subject of some confusion. 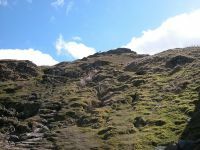 Wansfell Pike is a popular destination but in fact it's actually the lower companion of Baystones, a summit a kilometre to the northeast. 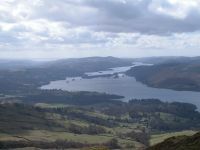 The confusion is partly Wainwright's doing, for he names Baystones as Wansfell in his books, and no dount many fellwalkers ascend Wansfell Pike thinking they've reached the true summit. 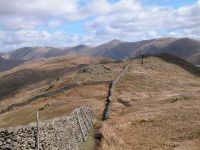 In mitigation it has to be said that Wansfell Pike is a far nicer top than Baystones. 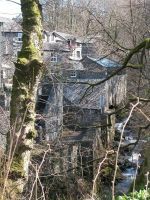 The approach road runs past Stock Ghyll Force, which I decided to take in on the way back, but I did grab this shot of the smart development of holiday cottages on the north bank.. 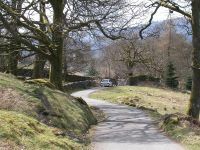 The road starts to climb a bit as it leaves the environs of Ambleside. 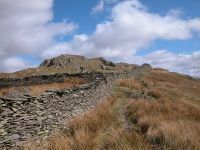 Wansfell Pike looms to the right.. 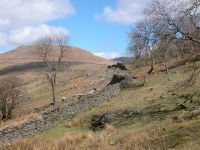 There's a bit further to walk along the road, after which the route to Wansfell Pike takes a footpath to the right..
A good view of Red Screes on the other side of Kirkstone Pass.. 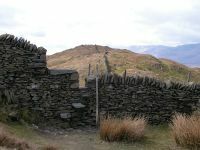 The first section of the footpath up to Wansfell Pike. 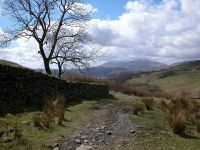 The path gains height quite quickly and soon gives a splendid view back down to Ambleside.. 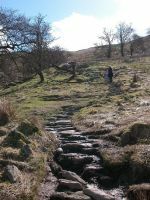 The path's popularity has made it necessary for stones to be laid to prevent erosion..
A footbridge about half way up.. 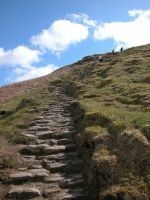 The path becomes rather steep in places. It's hard work but fortunately I'm nearing the top. 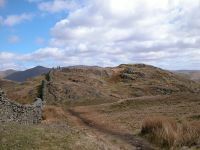 The last section of the ascent path with the summit crag beckoning ahead..
Ambleside from just below the summit. 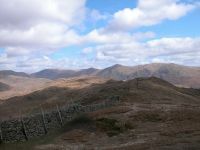 Snow still lays on Bowfell, seen in the distance. 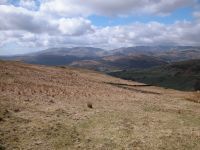 The Langdale Pikes are prominent immediately to the right of Bowfell.. 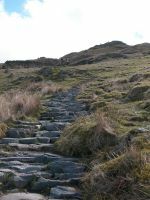 The ascent route from above.. 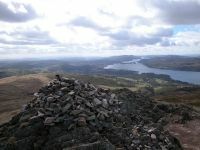 The view to the south from the summit cairn, looking directly along the greater part of Windermere. 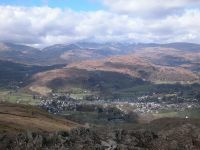 Zooming in on Windermere with the town to the left. 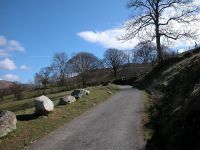 Part of Morecambe Bay can be seen to the left of Gummer How, the fell to the east of the lake. 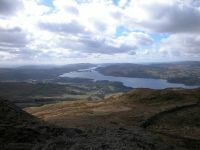 A beautiful view of Ambleside from the summit of Wansfell Pike. 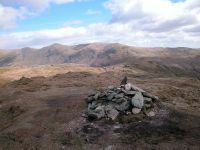 The summit cairn of Wansfell Pike - 1581 ft above sea level. 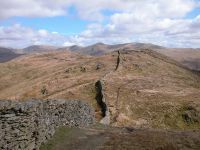 A look at the ridge between Wansfell Pike and Baystones (mostly in shadow, unfortunately). 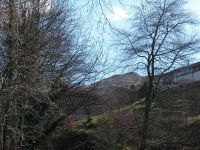 The Ill Bell ridge is seen beyond. 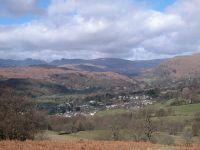 Sallows (almost out of shot to the left) and Sour Hows, seen across the Troutbeck valley. 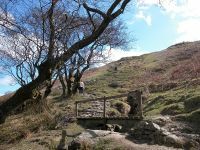 The ridgewalk to Baystones is relatively unfrequented judging by the meagre path. It also has some surprisingly steep gradients. 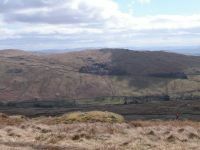 This is a nameless intermediate top between Wansfell Pike and Baystones. 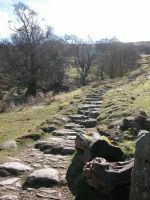 Another steep drop lays between here and Baystones. 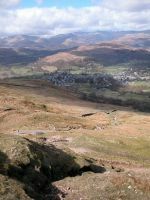 Ill Bell and its outliers crowd the skyline..
From the same spot, the view back along the ridge to Wansfell Pike..
Half a kilometre further along the ridge, and once again this is the retrospective view.. 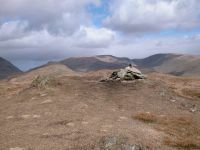 The summit of Baystones, a Marylin at 1601 ft. .
From the summit cairn, the view of the Ill Bell ridge beyond the Troutbeck valley..
A gap in the wall to the north of Baystones, where I stopped for a refreshment break. Rather than go back the same way I opted for a novel return route, taking advantage of the Right to Roam legislation to pick a line down the open fellside to the west. 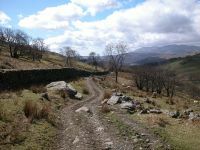 I'm aiming to get down to a farm track that runs back into Ambleside. It wasn't straightforward by any means. 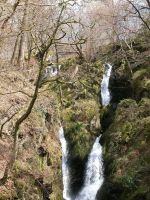 The fellside was unpleasantly wet and slippery in places and I twice went sprawling in the mud. 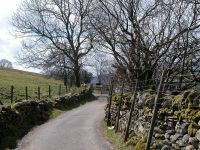 It also took ages to find the gate from the lower pasture into the farm lane. Here I'm making my way along the lower intake wall looking for the opening. 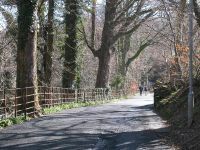 I eventually found the way into the lane and walked back along it towards Ambleside. Initially it was quite rough, though beautifully scenic. 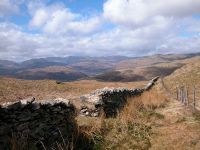 The Coniston fells form a neat group dead ahead. 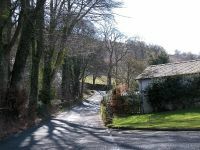 The lane improves in the vicinity of the farm. 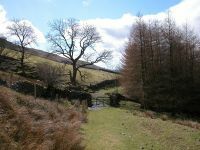 Looking across the valley of Stock Ghyll. Beyond the farm the track is surfaced, allowing better progress. 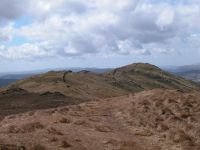 Shortly afterwards I passed the gate from which the Wansfell Pike path diverged and was back on my outward route. 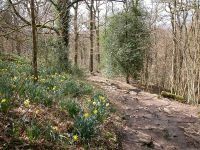 I took the side path down into Stock Ghyll woods. 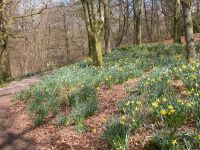 Not many leaves on the trees just yet but the daffodils were appearing in profusion. 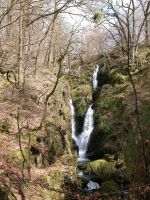 The gem of these woodlands - Stock Ghyll Force. ....and one of the upper part. 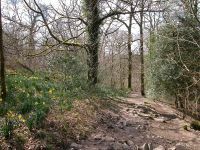 The path back through the wood was a little rough, and those who'd ventured down here in ordinary shoes were finding it a bit unpleasant. 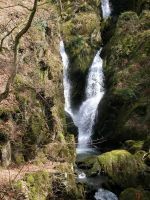 More scenes in Stock Ghyll Wood. 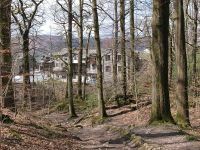 The first houses in Ambleside come into view on the opposite bank. 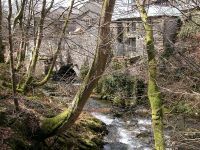 The weir adjacent to the holiday cottage development on the north bank. What an ideal place to spend a week. 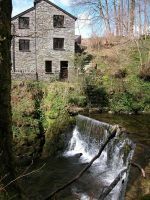 A final shot of Stock Ghyll before I strolled back into Ambleside for lunch.